Just One Block to BEACH! Cute and Comfortable Older Beach Home with Screened Porch! Just One Block to BEACH! Cute, and comfortable beach home with Screened Porch! 3 BR, 2 BA. 28' LR/DR Combo. Kitchen, Sunroom, Screened Porch, and Deck (up top). 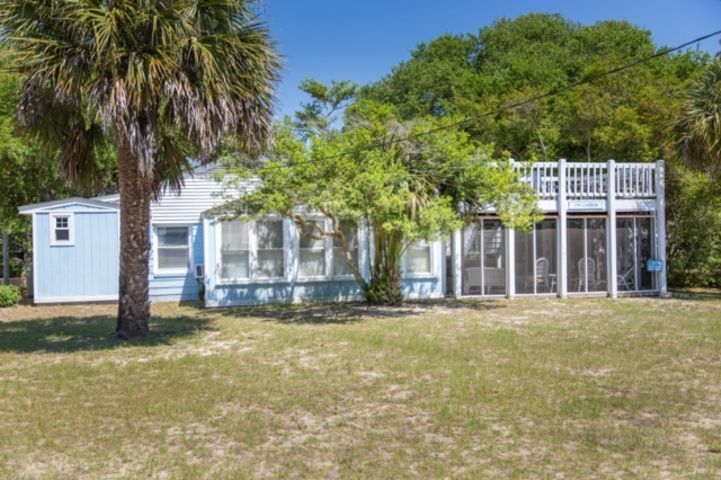 C/AC, 3 Cable TVs, 1 DVD Player, 2 VCRs, Microwave, DW, W/D, Gas Grill, and Beach Shower. Very short walk to the Beach. Please note that this is an older beach home and there are no modern upgrades. If a pet is approved, there is a $200 pet fee. Bed Sizes: 1K, 1Q, 2S, and Queen Sofabed in living room. When you book this property it also includes a $250 credit to order beach gear!! There are many options including bicycles, beach chairs, umbrellas, kayaks, paddleboards, etc.! Our partnered company, VayK Gear, will contact you 45 days prior to your arrival so you can place your order and they will deliver all equipment to your rental home. Just another added bonus for booking through Carroll Realty to enhance your vacation experience. ALL BED LINENS, KITCHEN TOWELS, AND BATH TOWEL SETS ARE PROVIDED FOR YOUR CONVENIENCE!! You will only need to bring or plan to rent beach towels, chairs, bikes, umbrellas, etc. Also included is a starter set of toiletries such as toilet paper, bath / dish soaps, paper towels, etc. but please do keep in mind you will most likely need to purchase these items after your initial arrival. Really enjoyed our stay and the house we rented wasn’t anything fancy but it was within a reasonable price. It also nice and cozy. We were only 1 block from the beach which took us less than 10 minutes to walk to. We plan on coming back in the future. Location was great! House needs a THOROUGH CLEANING! The beds were not comfortable and squeaked at each movement. Carroll realty was excellent to deal with. I will definitely use this agency in the future but probably not this property. The proximity to the beach is convenient. We enjoyed the experience of sitting out on the upper deck with a breeze and gorgeous view of the full moon. The screened in porch was enjoyable as well. The elderly next door neighbors are very pleasant . However, the property is lacking in several areas. The baseboards and floor edges had an obvious accumulation of all sorts of debris. The floor and carpet on the screened porch had not been cleaned in some time. The front storm door was bent did not close/ latch. Majority of screened porch furniture was old wicker chairs with broken wicker , one of which a loose rusty nail that was found by my husband when when he leaned back against it. Questionable electrical safety due to obvious overuse of extension cords and lack of GFI outlets in kitchen and bath areas. Thank you for your review and we're glad you enjoyed your stay for the most part. I have forwarded your review on to our owner, and discussed with her about replacing some or all of the porch furniture. We agree it is very dated and needs replacing. The baseboards need to be painted - we looked at this and it wasn't dirt but rather scuff marks and such that make it look dirty. I will discuss hopefully getting some fresh paint in this off season to help with the appearance. The porch/sunroom is cleaned (vacuumed) after every renter so I apologize that it appeared dirty to you. We had just replaced all the furniture out there and think it looks so much better (pictures haven't been updated yet to show the new furniture). We try to price the home very reasonably compared to the other older style beach homes that we manage. For the location and size of the homes we think the price is fair and lower than most other comparable homes. Everything was very nice, quiet and peaceful! Great Location but they need to hire a new cleaning crew! Great location.....a block from the beach access and a little over 1 mile to the grocery store. BUT, the House was filthy! We were smacked in the face with enough air freshener to sedate a small ryhno but once the fumes dissapated the living room rug smelled of dog urine. There was dog hair EVERYWHERE! I expected some in the corners or behind the couch but there was hair standing in the middle of the floors. All over the beds creaked and made it impossible to sleep. I would invest in new beds and a different cleaning crew! Very cozy, comfortable cottage on a quiet street. Plenty of room to spread out in. Great place to spend a relaxing week at the beach. Rates are subject to change until reservation is confirmed with a Carroll Realty employee. 50% payment is due within 5 days of making your reservation. Final balance is due 30 days prior to arrival date. We accept Visa, Master Card, or Discover or personal check if more than 30 days from arrival. All reservations are charged a non-refundable $65 damage waiver which covers accidental damages up to $1000. Cleaning Fee is waived when staying 7 nights or more. We book weekly only during the summer months from Saturday to Saturday. 3 night minimum any other time. Pet fees, if applicable, and damage waiver are non-refundable. No exceptions. Cancellations: After you have made payment, you will receive a refund minus a $50 fee only if the property is re-rented for the same time and price. We also offer travel insurance. There are 2 different plans: one is the traditional All Seasons Plan for an additional 7% or we also offer the Cancel For Any Reason plan for an additional 10%. The cancel for any reason plan must be purchased within 10 days of making the reservation. The other plan can be purchased any time prior to 30 days before your arrival. Please note: Travel Insurance should be booked and paid for through Carroll Realty, or through a link we can provide to you after booking.